Last week we marked the first day of fall here in Illinois, temperatures cooling down, and leaves just starting to change here and there. And for the last three years, another sign of fall's arrival is sharing the finished Summer Sampler Series quilt. I had so much fun this year. I loved our Summer Road Trip theme. I was so excited about the destination inspired blocks. I was giddy over the original blocks that some of our quilt along members designed on their own, based on their own travels - check out just a few here, here, and here. We had quilters repurpose some of our designs to reflect their own travel memories - here and here. I think I am leaving this quilt along more inspired than any before. I used the rainbow quilt mockup as my color inspiration. I moved at least 2 blocks, due to fabric that I had available at the time. Today we released our finishing instructions with directions to make the hourglass blocks and optional border. I added the border to my quilt. Lee finished hers without the border. She used gray tones for her hourglass blocks. Katie mixed rainbows with low volume prints. And I opted for a selection of rainbow crosshatch fabrics by Carolyn Friedlander with a few Timeless Treasures Sketch fabrics mixed in to expand my color palette. I used anywhere from 1 - 3 shades of each crosshatch color for my hourglass blocks. My biggest challenge was I was restricted to the colors offered in the crosshatch design, and how much fabric I had of each. Some of the colors I used were out of print, so when they were gone, they were gone. I'm really happy with how it turned out though and I think it bears a good resemblance to the inspiration graphic. I used a widescreen print by Carolyn Friedlander for my backing and binding. It was great to be able to just lay out the backing and not have to piece it together. I love widescreen! I wanted to quickly mention as well, this is a large quilt (for me). It finished at 80" x 80" with the optional borders. I free motion quilted it easily on my home machine, a BERNINA 440QE. I hope you all enjoyed quilting along (or watching the quilt along) over the last 20 weeks. 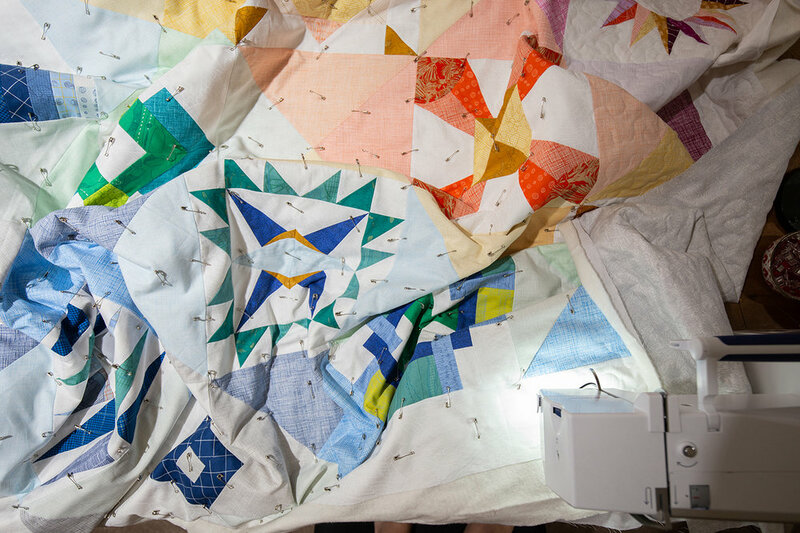 For those that are interested in making the quilt now or in the future, you can still buy it in Lee's pattern shop. I am already planning my next projects - after I take a quick breather! :) I can't wait to see everyone's finished quilts. To those who joined in this year, thank you so much! !